Written for and originally published in Transition Magazine, published by Disability Alliance BC. Over the last 20 years, a substantial shift has occurred. It is now understood that individuals with differing abilities have a right to belong in the community. The world of disability was much different 20 years ago. 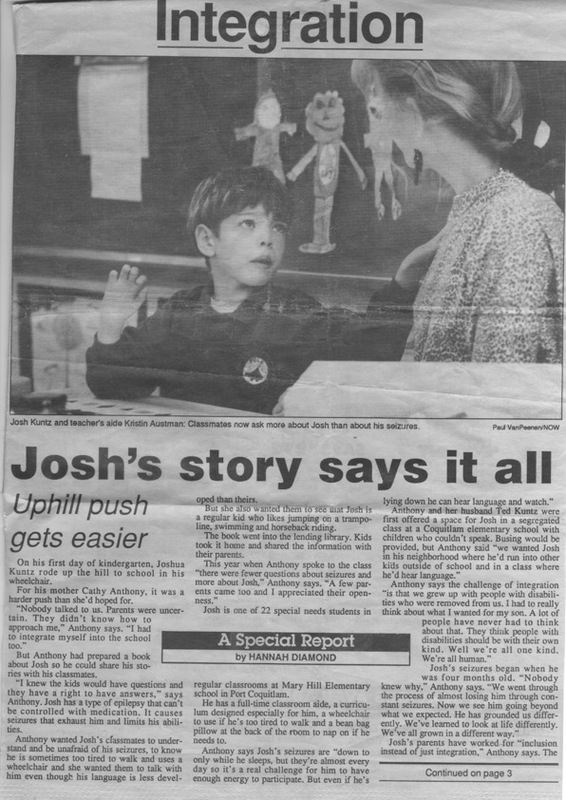 In 1989, my son Josh was the first child with significant disabilities to be admitted to his neighbourhood school. This advancement was not without significant effort. The first educational placement offered for our son was a segregated setting dedicated solely for children with significant disabilities. The other children were all bed bound and non-verbal. This is not we had in mind for our son. As a result of our steadfast refusal to accept anything less than full inclusion in his neighbourhood elementary school, Josh was finally accepted. The event was such an anomaly that his enrolment was front-page news on our local community newspaper. Cathy knew what to do. She knew that she needed to educate the parents and children about our son. She immediately got to work creating a storybook about Josh. She removed photos from our photo album and pasted them into a small book. With a colored marker she told the story of Josh. She explained his medical condition in five-year old language, and she assured the children that Josh was just like them. The next day Cathy asked Josh’s teacher if she could read the ‘Story of Josh’ to the students. What happened next was a harbinger of the changes that would begin to occur in communities around the country. Josh’s teacher asked if we would permit the storybook to stay at the school, and whether the other children might be able to sign it out and take it home with them for the night. The next morning was the first evidence of a community learning to welcome individuals with a disability. As we wheeled Josh to school a parent approached with their child. “Good morning Josh” they began. “I’d like to introduce my son to you.” “We read the story of Josh last night. Actually we read it three times.” The next day another parent approached and a similar experience occurred. And again, and again until Josh was fully welcomed into his neighbourhood community. What we came to learn is the community is a place of welcome and hospitality. It is filled with compassionate and caring people. However, the years of institutional care had deprived the community of the opportunity to welcome and learn how to be in relationship with individuals with a disability. Over the last twenty years a substantial shift has occurred. It is now expected that individuals with differing abilities have a right to belong in community. They have a right to attend their neighbourhood school, and to receive the same level of medical care and consideration available to every citizen. It is now expected that an individual with a disability can and should make a contribution to his or her community. And it is understood that individuals with differing abilities can be in rich and fulfilling, reciprocal relationships. We’ve also made advancements in our policies, practices, and resources for securing a good life for individuals with a disability. Canada became a world leader when they introduced the Registered Disability Savings Plan (RDSP) that provides a vehicle for parents and the community to contribute to the financial well-being of an individual with a disability, and for the individual with a disability to acquire wealth and financial security. British Columbia became the first province in Canada to formally recognize the validity of relationships in decision-making with the establishment of the Representation Agreement. Changes have also occurred with shifts in our expectation of housing, moving away from institutional and segregated housing to ‘home share’ and intentional communities like L’Arche and co-housing where individuals with disabilities live with individuals without disabilities. These shifts were inspired by the vision of Canadian Jean Vanier. Employment is increasingly available to individuals with a disability as we have learned how to modify workplace environments and adjust expectations to accommodate individuals with differing abilities. 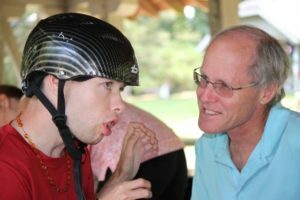 What has shifted substantially in the last 20 years is an understanding of the importance of belonging, not only for individuals with disabilities, but also for all individuals. We all benefit by having rich networks of support. The journey of welcoming and including individuals with a disability has transformed our communities into kinder and gentler places where we all have a right to belong and a responsibility to facilitate belonging. The last 20 years has been a transformative time in our maturing as a community. While there is more work to be done, the changes in expectations, understanding, and our ability to be inclusive have been truly remarkable. Much of the credit goes to the pioneering families and self-advocates who held the vision of belonging and inclusion.